Today I would like share with you the details of my upcoming class Saturday August 1st 1000-1230. I am looking forward to sharing with you a fun unique and creative take on using crackle medium on your layout backgrounds. Class fee is $18.00 pp and the workshop fee is TBC [up to $25.00pp]. OH AND it can be done in a variety of colours not just black and white! Please call the shop 08 8277 1298 for further details and or to book in. Our All Day Scrap for 2015 has come around so fast. If you need reminding - the Date is Saturday 25th July. Here are the promised Sneak Peaks of our All Day Scrap Projects and class requirement lists. There is still room for a few more people if you are interested in attending. I will include the information about the all day scrap under first timers. The projects are now in our store on display for you to come in at look at. If you are attending, please check each teachers requirements list and photos needed for their project. Also please bring your basic scrapbooking kit. I have listed the items below for your basic scrapbooking kit. Paper piercer and cork mat (mouse pad). Some All Day Scrap Survival tips. Have an early night the night before. Eat breakfast - Macdonald counts if you are traveling a distant. Bring a large bottle of water and some nibbles for the afternoon 2 o'clock sugar fix. For first timers or those thinking of joining us - The all day scrap is held in the Colonel Light Gardens Uniting Church across the road from our shop - please park in the church car park and not in our store car park. If you park on the street, please follow any parking signs. The shop is open from 9am and the classes over in the church start at 9.30am. The church will be open from 9am and not before. Remember, the $135 fee includes your morning high tea and lunch, along with a "thank-you for attending gift" from us, all your class kits and a generous $25% off in our shop (kits sold in our store are excluded from the discount). You will be making three amazing projects along with your own name tag (designed by Louise Nelson). All our teachers are on design teams for some very well known scrapbooking company's and have their work publish here in Australia regularly. Nat's has a lovely layout for you - a perfect double page for yourself or any family female. She will be sharing with you her tips for layering and adding lots of elements to your pages. Although it's a double 12x12 layout there are some great little embellishment ideas that would work well in a project life style album. You will need to bring 2 vertical Black and white 6x4 inch photos + 1 horizontal black and white 6x4 inch photo and 1 horizontal 3x4 black and white photo. Nat also needs you to bring a border punch -Martha Stewart, Fiskar or EK will be fine but not a deep edge punch. 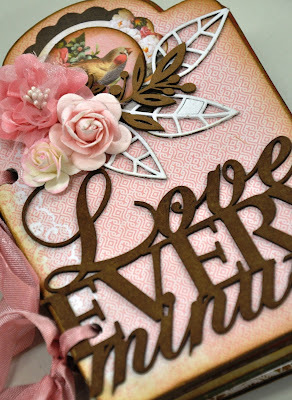 Nat used a scallop edge punch on her page. Nat has not used any inking on her layout. 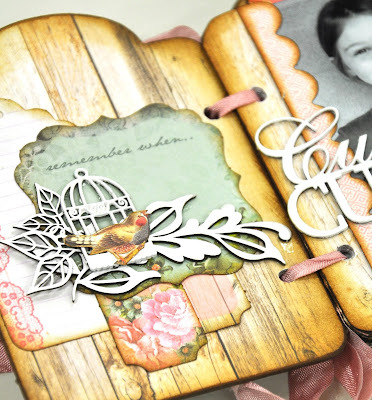 Belinda has designed a beautiful shabby album using Kaiser papers and lots of Imaginarium Designed Chipboard. Belinda's album has about 15 pages, so please bring a stack of beautiful black & white photos, that you can add to your pages as you go along. 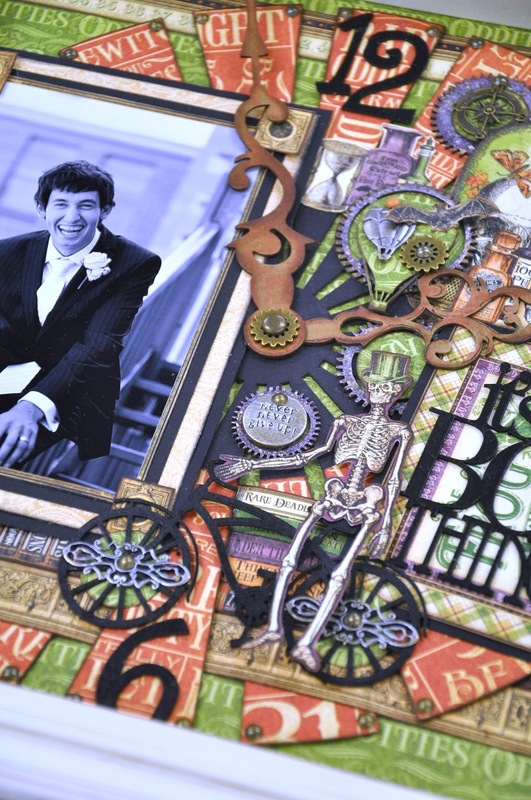 Belinda will share her tips for adding and layering chipboard on your projects. Each page has great ideas that can be used on your cards as well as small mini projects. Photos need to be 4x6 inches, but you will be trimming them down to fit on your tags. Belinda needs you to bring a craft knife and mat, standing tool or sanding block, brown ink (Belinda used a Gathered Twigs distress ink pad and sponging block) 1 inch corner rounder and a single hole punch or cropadile. I have a very special layout for you using Graphic 45's latest collection. Its a layout I have made for my newest Son In Law. It's perfect for any male of any age. I have added some mixed media techniques as well. The skeleton is optional so don't let him put you off! My layout has lots of fussy cutting and layering, + charms and chipboard galore. It's a bit "where's wally" if you know what I mean. Lots to see and find each time you look at it. I will be sharing my tips for inking & painting your chipboard and charms along with a bit of heat embossing thrown in. You won't need a photo to do the layout, but it would be handy if you can bring one. I use a black and white 4x6 inch portrait photo. I need you to bring a brown ink pad, (chestnut roan or vintage photo distress ink) also a terracotta (rusty hinge distress ink or a pumpkin spice chalk ink) and purple ink pad (dusty concord distress ink or a blackberry versa cube), black archival ink pad - must be archival or stazon. Gel glue and a small paint brush. Remember with your 25% discount off our shop, you will time to grab anything you need for the day before the classes start. Also we will have spare ink pads and extra bits and pieces you can borrow for the project. We are very excited about our All Day Scrap. We have a great time and just love sharing our passion for scrapbooking with the ladies attending. So if you have not attended before or haven't booked in yet, there is still some spaces left. Please ring our store and book in. Looking forward to seeing you all next week.